The Spotinst Health Check service will be installed on your VPC. You should open traffic from your Elastigroup to Spotinst Security Group and to one of your instances that will be assigned to a Security Group. EC2 private instances in your VPC. Spotinst will trigger the proxy service on each check. The proxy will communicate with your private instances in the VPC and will send the results to Spotinst. 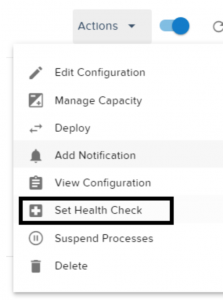 When an instance is marked as unhealthy, and the Elastigroup Health Check type is set to HCS, Spotinst will replace it with a new instance according to the Elastigroup config. Create a Spotinst Elastigroup if you do not have one already. 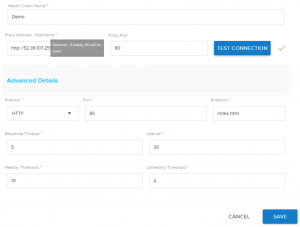 Install the Spotinst Health Check Service on an instance ( we recommend a dedicated On-Demand instance) within your secured VPC. Choose one of your instances that will act as the proxy, on which you should later install the docker. Protocol: Which protocol will Spotinst use to check the healthiness of your instances. Supported for now are: http / https. In the Compute part select “HCS” as HealthCheck Type. Go to your Elastigroup and click on Edit. On the Compute tab, in the Launch Specification section, set the health check type to HCS and update the group. Note: You can do steps 3 and 4 via our API. For more information go to Our API wiki. Now – the health check is running, and Spotinst’s monitor service will send HCS requests according to the specified interval. In the case of an Instance failure – the HCS service will trigger a replacement operation to launch a new instance and terminate the unhealthy one.